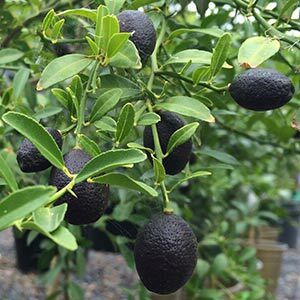 The two major species are Citrus glauca or ‘Desert Lime’ and Microcitrus australasica ‘ Finger Lime’ are two of the more popular native citrus trees. Australia has six species of citrus, all commonly called finger lime, native lime, wild lime or similar. The species are C. australasica, C. inodora, C. garrowayi, C. maideniana, C. glauca and Citrus gracilis. The ‘Finger Lime’ is a rainforest understory tree that can reach 7 – 10m in height. This is the most widely available species. The ‘Desert Lime’ is a smaller tree, often only reaching 3 – 4 m in height. It does as the name suggests require a dry climate to thrive. Grafted varieties may become available in the future. Native citrus are used commercially, however it is the developed cultivars such as the ‘Sunrise lime’, Australian Red Centre Lime or ‘Blood Lime’ and ‘Outback Lime’ that look to have greater commercial potential. The rootstock of Australian Native Citrus also has potential, when grafted to commercial citrus drought tolerance may be improved. Look for the developed cultivars at your local nursery.